Andri was born in Reykjavík on 14 July 1973. He comes from a family of doctors and nurses. His father is a doctor, his mother is a nurse, his sister is a brain surgeon, his brother is a student but his wife is a nurse. Andri is married to a nurse, her sister is in med school, his mother-in-law is a nurse and her sister too. His great grandfather was a doctor in the Westfjords of Iceland. His grandfather, Björn Thorbjarnarson, is married to a nurse from Toronto, was a chief surgeon at the New York Hospital and professor at Cornell University. Björn wrote the bestseller "Surgery of the Bilinary Tract", 1975. Andri lives in Reykjavík; he has four children. 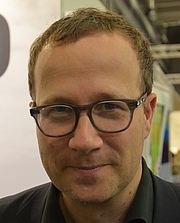 Andri Snær Magnason is currently considered a "single author." If one or more works are by a distinct, homonymous authors, go ahead and split the author. Andri Snær Magnason is composed of 9 names. You can examine and separate out names.